Ah, it’s the end of another school year. The internet is filled with articles and funny tweets about how sad parents are that school is out (or almost out). I can’t relate to any of them. Not one. You see, when your child struggles in school every. single. day., you count down the days until summer with glee, not dread. Every time we drive by school, we feel a little sick to our stomachs. Not as sick for those three months each year called summer. We are happy to have our kids at home if it means a break from calls home, behavior citations, high emotions, IEP meetings, impossible homework, end-of-grade testing stress, etc. We actually ask for a school meeting, trying to cram in one more IEP meeting to address all that went wrong this year, with hope for next year. We run through fields singing happily. Okay, that might be a bit dramatic, but the temporary lifting of school stress makes us feel like singing and dancing. There’s color in the world again. School drop off the first week is smooth due to excitement about a new beginning. School drop off the last 20-25 weeks requires bribing, if we can even get them out of the house willingly at all. Other parents say, “Summer is coming,” with doom and dread. We say, “SUMMER IS COMING!” with pure joy. Other parents are planning summer camps and elaborate vacations for a week or two. We are planning to do NOTHING, because the school year sucked all the energy right out of us. Our kids can’t handle long stretches away from the familiar anyway. Our nightmares about homework and IEP meetings — the ones that cause us to wake up in a sweat everyday — wane to once or twice a week for a while. 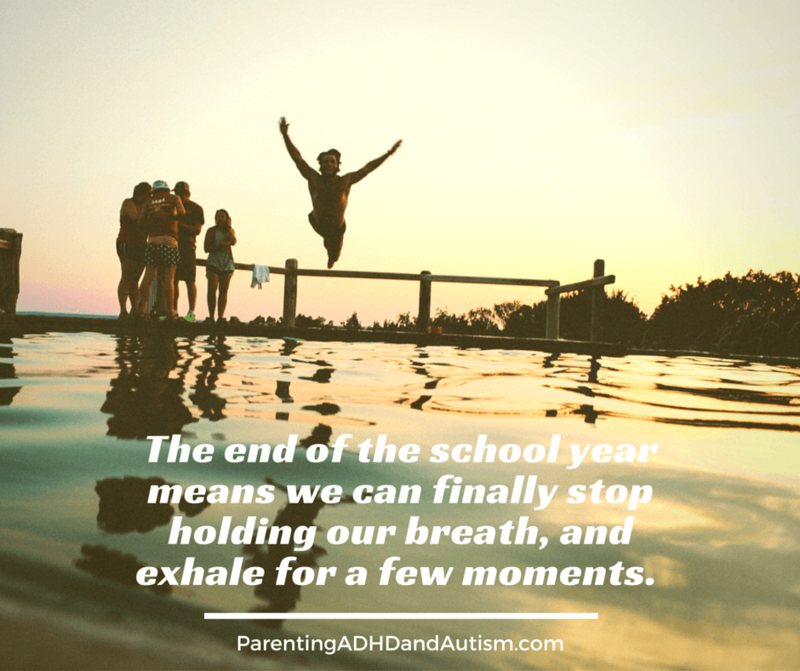 We can stop holding our breath and finally exhale. We can’t get used to it though — the stress of school with a child with ADHD, autism, learning disabilities, and other special needs is looming right around the corner.